Provided photo Covington donor Rike Miller made his 100th lifetime donation at the Feb. 11 Covington Eagles blood drive. COVINGTON — Covington donor Rike Miller joined the Covington Eagles in answering the call to help Community Blood Center build a new generation of platelet and plasma donors in 2019. Miller made his 100th lifetime donation at the Feb. 11 Covington Eagles blood drive, and it was truly a triple milestone. The Covington Eagles traditionally host six CBC blood drives per year. 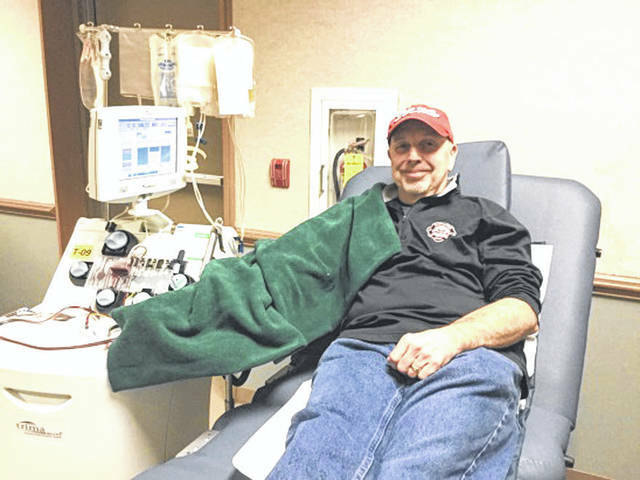 Monday’s was the first to include the opportunity to donate platelets and plasma, and the expanded hours of 1 p.m. to 7 p.m. to allow more time for these donations. Miller has been a whole blood donor with CBC since 1998. He has averaged six donations per year by consistently donating at all the Covington Eagles blood drives. But with the new options introduced at the Covington Eagles blood drive, Miller made his first lifetime plasma donation. It was an impactful decision because Miller’s blood type is both rare and the perfect type for plasma donations. Less than one percent of the population is AB negative, and AB negative is the “universal donor” for plasma, meaning any patient in need can receive it. Miller is also a “baby donor” because he tests negative for CMV, the common cytomegalovirus. Hospitals prefer CMV-negative blood for transfusion to infants, children and other immune-deficient patients. Miller helped the Covington Eagles blood drive reach 98 percent of goal, with 53 whole blood donors and 39 whole blood donations plus three platelet and plasma donors. https://www.dailycall.com/wp-content/uploads/sites/30/2019/02/web1_image007.jpgProvided photo Covington donor Rike Miller made his 100th lifetime donation at the Feb. 11 Covington Eagles blood drive.